Fostex T50RP mk III Modded Build - New Cups, Cable, the works! 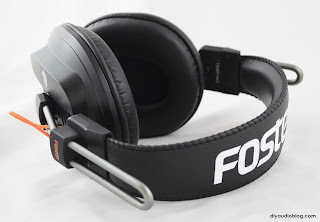 If you've been following my posts you'll see I usually leave audio products alone once I get them ... kidding ;) I picked up a Fostex T50RP mk3 (or mk III, however you want to write it) so I could see the differences from the original T50RP I modded. 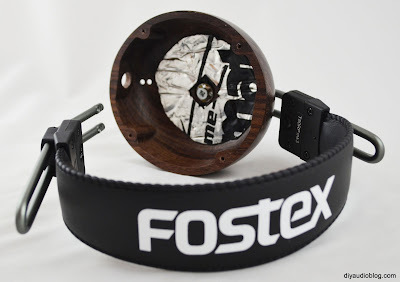 Other than a different headband, removeable cable, and different handling of the felt behind the driver, there was no difference, so I suggest if you are already modding, go with the original as it's cheaper and you can set up the felt however you like. 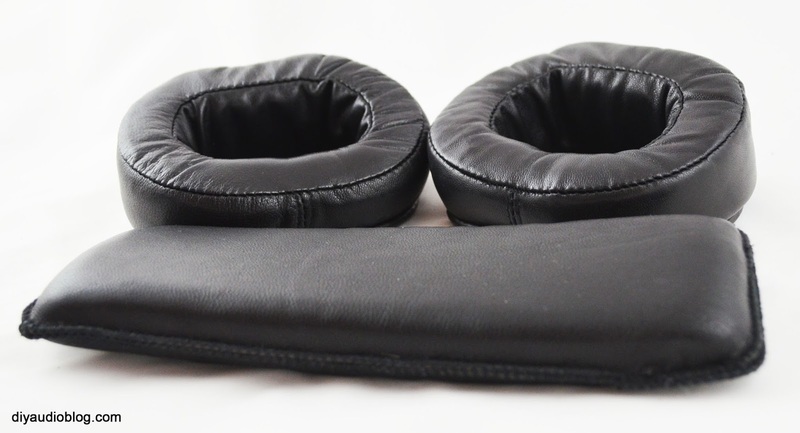 If you still want the mk3, You may consider purchasing across the pond, it seems like Fostex has a deal with U.S. retailers that they can't advertise below $159.99, but it averages around $130 in the UK... much more palatable as you're replacing everything anyway. I had some very nice wood cups CNC cut for me by my friend Fewzi (if you'd like his contact information, shoot me a message, we're hoping to offer at Zynsonix soon), the quality of the machining is excellent, perfect driver fit. CNC machining has really changed the way a lot of things are manufactured in a positive way, the amount of precision it offers is outstanding. Anyway, the wood cups rock. 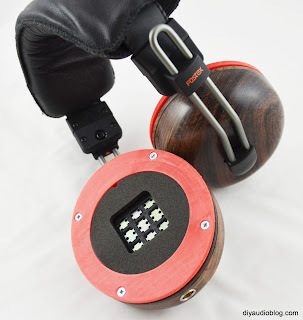 There is the cup itself, a second wood layer with a square hole that holds the driver in place, and a third plastic layer that holds the ear pads in place. 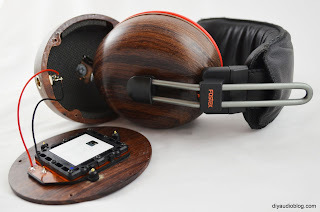 This picture below shows a wood ring and plastic ring for the earpads, Fewzi discovered that plastic was more durable for the earpads to stretch over (it's a tight fit). First the stock pads and foam are removed. 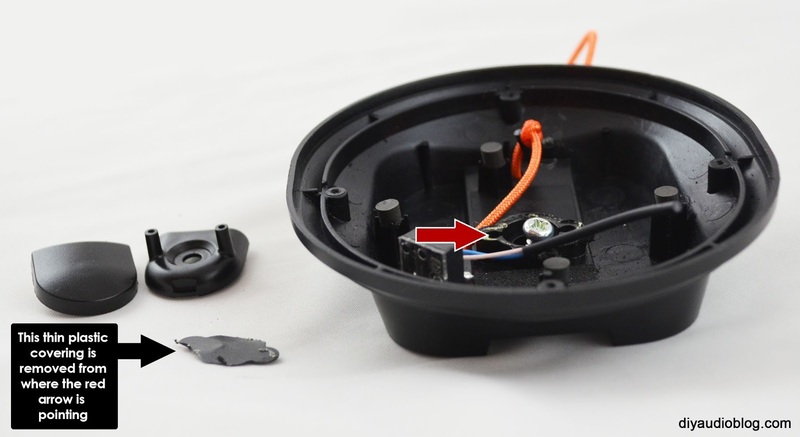 Then the driver frame is unscrewed (4 screws), and the driver unscrewed from the frame (3 screws). There is an extremely thin gasket that sandwiches between the driver and frame that needs to be handled gently. The drivers are snipped free and then I had to remember how to get the cups off. I didn't want to read my existing post because I enjoy discovering how things come apart and go back together. 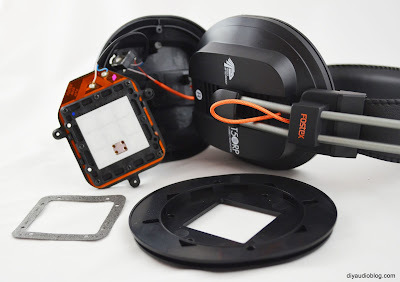 Fostex hides the screw behind a thin shroud of plastic, which I believe is sonically welded in place (micro-vibrations that fuse plastic together). It comes off with a razor, and once unscrewed, releases the clamp on the other side. That's about the only unusual aspect of the assembly. 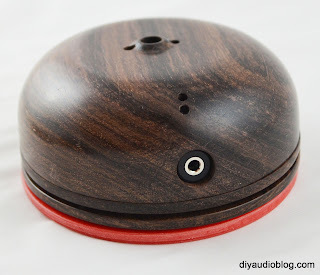 Once everything is apart, the wood cup was fitted. There are little brass fittings included with the wood cup (the original plastic ones are too small) that allow the cup to pivot when screwed in, I found the sizing of the brass fitting and tightness of the screw makes a huge difference in the articulation. If anyone has heard a T50RP, modified or otherwise, they know there is no lacking in the bass department. this is where mass damping plays an interesting part. Adding loaded sheets like Dynamat Xtreme can help curtail flabby bass and tighten things up. Adding foam with a texture can also assist with reducing reverberation / standing waves in the cup. 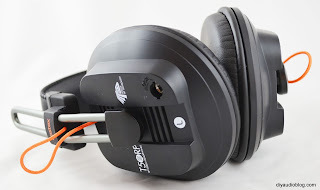 The cups included 3.5mm mini inlets, which are great, but I personally like the mini XLR for headphones due to it's locking mechanism, and I could configure it the same as Audeze headphones, which you can read more about here. The driver is fastened on to the wood frame, which was a fantastic fit, with the gasket in place. Wiring up is a simple ordeal, but I wanted to ensure all the original solder was removed so I could replace the tin solder with Cardas Quadeutectic solder. The tabs are marked with a "+" and "-". Below you have a view of both sides being soldered in. Once the drivers are happy, the frame is lined up on the cup and it's important to ensure no stress is on the solder pads, so loose wiring is okay here. Then the earpad frames are sat on top and four screws replaced. The foam that was set aside in the first step is replaced in each cup. This could be no exciting rebuild without fancy pads. Fortunately there are a couple different types available from ZMF (run by Zack, cool bro), and MrSpeakers. ZMF has a number of pads available, including lambskin, cowhide, protein, and Omni. 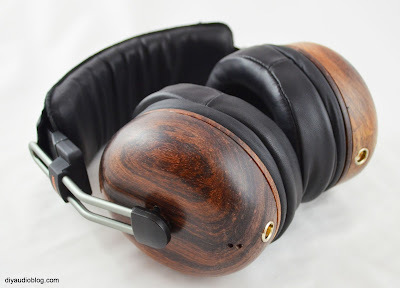 MrSpeakers offers the Alphapads which are lambskin. Lambskin seems to be the most popular headphone pad material for higher end headphones, for which I am glad, I hate velvet ;) ZMF also has a nice "pilot pad" to provide some extra cushion on the top of your head. ...where's the cable you ask?! We won't have any sound if we don't have a cable. Where will we get a cable from? 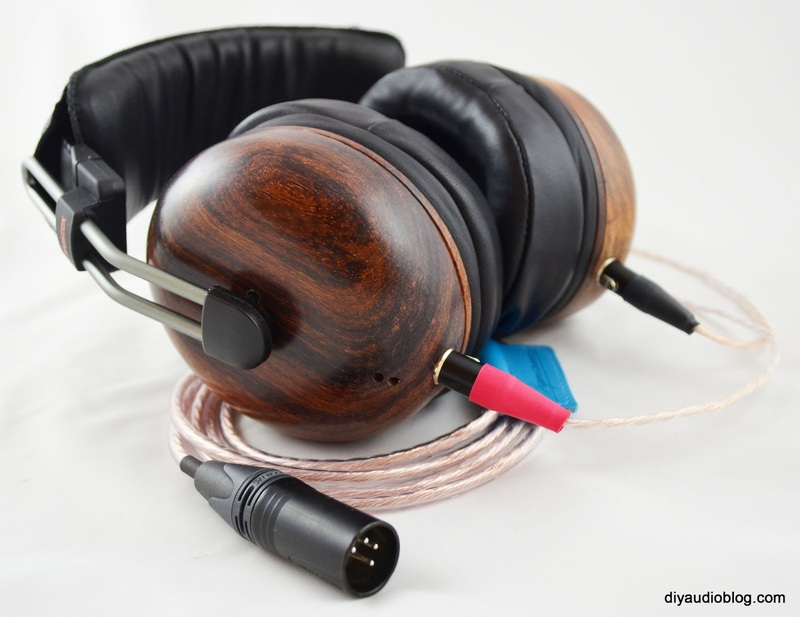 Fortunately, we have the brand new Zynsonix Ballista cable here, featuring 28 strands of ultra pure ohno cast copper, 12 of which are clad with high purity silver in an alternating geometry, then each are electrically isolated with a clear coat, fed through low loss dielectric, resulting in an extremely well balanced sound with great detail retrieval... completely custom made for Zynsonix. There we go, now we're talking! 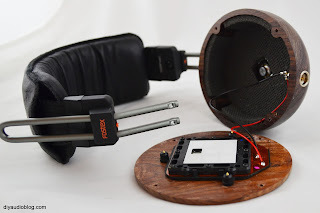 I'm now going to reveal a special secret that will enhance your life forever make your cans sound better... you can get the Zynsonix Ballista configured for pretty much any headphone you have. It's the best cable I've made to date, I spared no expense, because you guys deserve it. 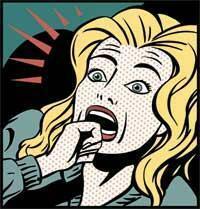 Use the handy dandy contact link to share what you need. Also if you are interested in purchasing some great sounding cups, feel free to reach out as well. Fewzi is experimenting with some additional woods now, so there should be a variety of species to choose from. Anyway, that's all from me. Happy listening, building, etc. and don't be a stranger. Disclaimer: The above steps detailing the building of a headphone are for entertainment purposes only and not intended to be used as directions. The owner of this blog and all associated parties can not / will not be held responsible if you attempt the process posted and cause physical harm to yourself, your surroundings or your property.